Source: Thanks so much to Bonnier Zaffre/Hot Key Books for providing me with an e-ARC of this book via Netgalley! 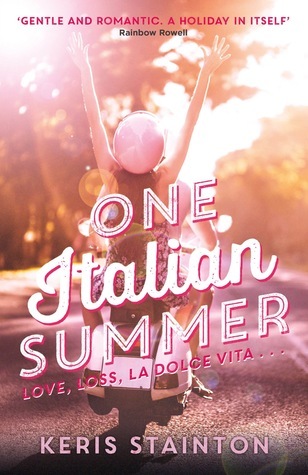 One Italian Summer was such an uplifting, adorable story. The second I saw it on Netgalley, I knew I needed it in my hands. Visiting Italy has always been one of my dreams, and I was so happy to be able to in this book! To briefly synopsize the story, it follows a teenage girl named Millie whose family travels to Rome, Italy almost every year. This year, though, will be her first time going after her dad passed away, and she is scared that it will be different and just not as fun as it used to be. Adding in being scared to see a guy whom she’d hooked up with the year before, Millie has even more to be anxious about. Will Milly be able to find herself again through all of this mess? I have to say that I was really fond of Millie. Her sweetness and loyalty stunned me, and even though her dad’s death did get her upset once in a while, I believe that she was able to work through it and distract herself very well. I definitely saw bits and pieces of myself in her, and that is one thing I love about certain book protagonists. Although I’m not completely sure if Millie and the love interest Luke were *the best* for each other, the romance was definitely still noteworthy and cute. I don’t think it was this book’s best quality, though. Also, may I take a second to talk about the FAMILY TIES in this book?! I absolutely loved Millie’s relationships with her remaining family members. Despite the fact that her dad’s death kind of ripped them apart, I loved seeing them brought back together by the end of the book. The one tiny thing that bugged me about this book was that yes, it was set in Italy, but there were very limited descriptions of the country. I wanted to hear more about the beauty of a place that Italy is! All it takes is one extra page to describe all of Millie’s beautiful surroundings, come on! This is one of the books I’ve been forcing myself NOT to request on NetGalley. I want to read it so bad, because I’m an Italy-a-holic after going there last year. I’m so behind on my ARCs, but your review just pushed me over the edge. Dang it. Requested. 😀 Great review!